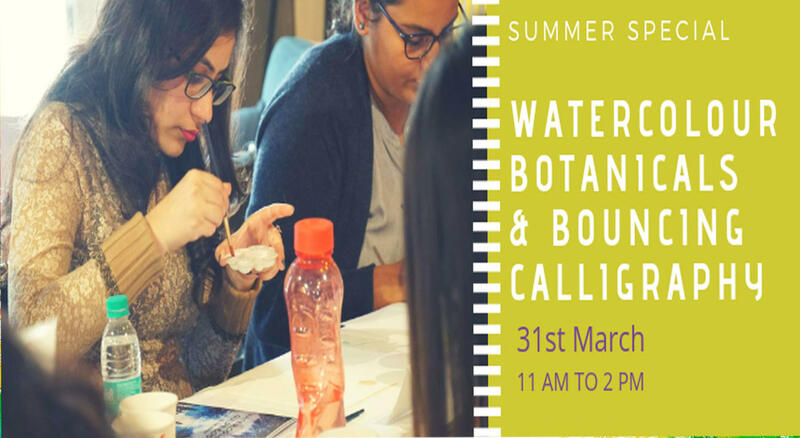 2 IN 1 Watercolour Botanical & Bouncing Calligraphy Workshop. Did you ever think how do artist paint so beautifully with Watercolours? How are people able to create art out of calligraphy? Believe me there's no magic. It's just that they are aware of all the right techniques. So, here I'm back with "2 in 1 Workshop: SUMMER BOTANICAL AND BOUNCING CALLIGRAPHY" which we have specially designed for both Intermediate level as well as for the people who want to explore & create new things out of it by taking your watercolour & calligraphy skills one more step ahead. At the end of the workshop, you'll be able to apply various watercolour techniques, Bouncing Calligraphy to create & Design a new piece of art- Paintings, Bookmarks, Cards, Name cards, Book cover, First page of your personal diary, Journals, Tags, Badges, etc. The workshop will help you explore new skills by designing your very own quotes. Enjoy and Learn during this 3-hour session that enables you to learn various techniques all at single platform & beautiful art work which you will get to take home back. ● Building muscle memory by learning 7 Basic pen strokes. ● Connecting letters to form a word. ● Learn how to bounce a word. ● Must know watercolour techniques. ● How to paint different types of leaves. ● How to paint 5 different types of flowers. 3. CREATE AN ART WORK COMBINING BOTH FLORAL & CALLIGRAPHY WHICH YOU CAN ALSO TAKE IT HOME. · High Quality A 5 & A 6 size water colour sheets. · Faber Castell Brushes: Size 2, 6, and 10. · Pencils, eraser, & other stationary. · Goodies designed by @juventasdesigns. · International hard tip brush pen. Price Include Art Supplies, Snacks & Drinks.